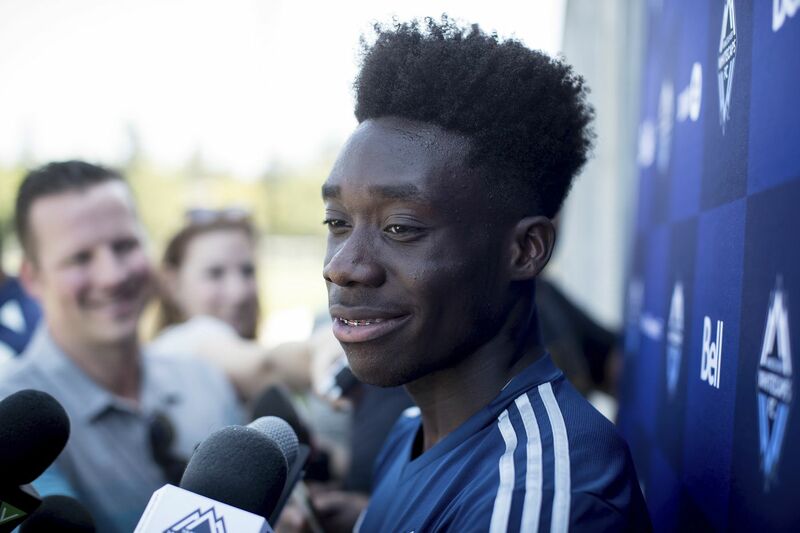 Alphonso Davies' move from the Vancouver Whitecaps to Bayern Munich set a record for the largest transfer fee in Major League Soccer history. It's been just a little more than two weeks since Alphonso Davies' big-money sale from the Vancouver Whitecaps to Bayern Munich caused an earthquake in Major League Soccer, and the aftershocks are still being felt. Among the places feeling the trembles is Philadelphia, and not just because part of the Davies saga unfolded here. The next homegrown player to move from MLS to a European club could very well come from the Union. It could be Auston Trusty, perhaps, or Anthony Fontana or Mark McKenzie. None of them will go for $13.5 million, which is what Bayern paid for Davies — and it could surpass $20 million with performance bonuses. But they could command a few million dollars each, and if they keep developing, they should. The Union are well aware of this, and they will be ready to make a deal when the time comes. Owner Jay Sugarman signaled that by hiring Ernst Tanner as the team's new sporting director. Sugarman repeatedly referred to Tanner's acumen in the transfer market when Tanner was introduced at Talen Energy Stadium on Thursday. Sugarman spoke of wanting to hire "someone who can ID talent, recruit talent, can help develop that talent, and then has a successful track record in the transfer market of having other clubs recognize that talent." He praised Tanner's "track record in the transfer market [and] the development success he's had with top-name players." In an ideal world, Tanner wouldn't sell players if he didn't have to. "We want to hold our players," he said, "because it does not make sense, if we want to develop further on and evolve, to sell our best players." But he knows that is only an ideal. Rest assured that he is ready and willing to sell. "All clubs are selling clubs when they are at a level that they cannot hold their players. That is usual," Tanner said. "That is the same question we had in Austria. That is a development league where they need to sell players when they are above the level of the league, and you cannot hold them." >> READ MORE: Can Ernst Tanner bring the next Roberto Firmino to the Union? He's done it before. MLS is a development league, too. It hasn't always wanted to be, but over the last few years, it has finally realized that it is, and that this is good. Just ask the New York Red Bulls, who sold young American Tyler Adams for a fee expected to reach $5 million, and New York City FC, which sold former MLS college draft pick Jack Harrison for $6 million. Atlanta United bought young playmaker Miguel Almirón not just to win games, but also intending from the start to sell him eventually for more than the $8 million he cost. "It's an incredible showcase for the sport worldwide that Major League Soccer is a real player and can develop some of the best talent in the world," Whitecaps chief operating officer Rachel Lewis said. "As people see the opportunity, they're going to want to be a part of it." It has been written many times on these pages that it is good for MLS clubs to sell players. Earnie Stewart has said so, Sugarman has said so, MLS commissioner Don Garber has said so, and as you might have guessed, this writer has said so. Why keep returning to the subject? Because in many ways, it goes against what Philadelphia sports fans are used to. The Eagles, Phillies, Flyers and 76ers would never view selling players to other teams as a good thing. But in soccer, it's a great thing. By the way, if you think the big clubs of Europe don't sell players, you're wrong about that, too. Just this week, Barcelona sold defender Yerry Mina, a breakout player at this year's World Cup, to Everton; and Chelsea sold stalwart goalkeeper Thibaut Courtois to Real Madrid. Every team in the world sells players. There's no reason MLS teams shouldn't. "Our sport will be in a position where it gets to the next level when we start producing players that are very good players in MLS and do attract that international interest," Whitecaps president Bob Lenarduzzi said. "If we as a league and as clubs continue to invest in player development, there will be more examples of this down the road." Saturday, 7:30 p.m. at Gillette Stadium, Foxborough, Mass. F Juan Agudelo: Look up the word "mercurial" in the American Soccer Dictionary, and you might find his picture. The 25-year-old still shows flashes of the skill that made him a phenom as a teenager, but his goal last weekend was his first since March 24 — and last year, he didn't score after July 29. M Kelyn Rowe: There was a lot of chatter before the trade deadline that the creative midfielder would be dealt, but nothing happened. If he can help the Revs make the playoffs, expect there to be more interest. M Diego Fagundez: Now in his sixth season as a pro, the playmaker has seven goals, seven assists and a team-best 2.9 chances created per game.